The Environmental Protection Agency may have suppressed an internal report that was skeptical of claims about global warming, including whether carbon dioxide must be strictly regulated by the federal government, according to a series of newly disclosed e-mail messages. Less than two weeks before the agency formally submitted its pro-regulation recommendation to the White House, an EPA center director quashed a 98-page report that warned against making hasty "decisions based on a scientific hypothesis that does not appear to explain most of the available data." The EPA official, Al McGartland, said in an e-mail message to a staff researcher on March 17: "The administrator and the administration has decided to move forward... and your comments do not help the legal or policy case for this decision." The e-mail correspondence raises questions about political interference in what was supposed to be a independent review process inside a federal agency -- and echoes criticisms of the EPA under the Bush administration, which was accused of suppressing a pro-climate change document. Alan Carlin, the primary author of the 98-page EPA report, told CBSNews.com in a telephone interview on Friday that his boss, McGartland, was being pressured himself. "It was his view that he either lost his job or he got me working on something else," Carlin said. "That was obviously coming from higher levels." E-mail messages released this week show that Carlin was ordered not to "have any direct communication" with anyone outside his small group at EPA on the topic of climate change, and was informed that his report would not be shared with the agency group working on the topic. "I was told for probably the first time in I don't know how many years exactly what I was to work on," said Carlin, a 38-year veteran of the EPA. "And it was not to work on climate change." One e-mail orders him to update a grants database instead. For its part, the EPA sent CBSNews.com an e-mailed statement saying: "Claims that this individual's opinions were not considered or studied are entirely false. This Administration and this EPA Administrator are fully committed to openness, transparency and science-based decision making. These principles were reflected throughout the development of the proposed endangerment finding, a process in which a broad array of voices were heard and an inter-agency review was conducted." Carlin has an undergraduate degree in physics from CalTech and a PhD in economics from MIT. His Web site lists papers about the environment and public policy dating back to 1964, spanning topics from pollution control to environmentally-responsible energy pricing. After reviewing the scientific literature that the EPA is relying on, Carlin said, he concluded that it was at least three years out of date and did not reflect the latest research. "My personal view is that there is not currently any reason to regulate (carbon dioxide)," he said. "There may be in the future. But global temperatures are roughly where they were in the mid-20th century. They're not going up, and if anything they're going down." Carlin's report listed a number of recent developments he said the EPA did not consider, including that global temperatures have declined for 11 years; that new research predicts Atlantic hurricanes will be unaffected; that there's "little evidence" that Greenland is shedding ice at expected levels; and that solar radiation has the largest single effect on the earth's temperature. If there is a need for the government to lower planetary temperatures, Carlin believes, other mechanisms would be cheaper and more effective than regulation of carbon dioxide. One paper he wrote says managing sea level rise or reducing solar radiation reaching the earth would be more cost-effective alternatives. The EPA's possible suppression of Carlin's report, which lists the EPA's John Davidson as a co-author, could endanger any carbon dioxide regulations if they are eventually challenged in court. "The big question is: there is this general rule that when an agency puts something out for public evidence and comment, it's supposed to have the evidence supporting it and the evidence the other way," said Sam Kazman, general counsel of the Competitive Enterprise Institute, a non-partisan think tank in Washington, D.C. that has been skeptical of new laws or regulations relating to global warming. Kazman's group obtained the documents -- both CEI and Carlin say he was not the source -- and released the e-mails on Tuesday and the report on Friday. As a result of the disclosure, CEI has asked the EPA to re-open the comment period on the greenhouse gas regulatory proceeding, which ended on Tuesday. The EPA also said in its statement: "The individual in question is not a scientist and was not part of the working group dealing with this issue. Nevertheless the document he submitted was reviewed by his peers and agency scientists, and information from that report was submitted by his manager to those responsible for developing the proposed endangerment finding. In fact, some ideas from that document are included and addressed in the endangerment finding." That appears to conflict with an e-mail from McGartland in March, who said to Carlin, the report's primary author: "I decided not to forward your comments... I can see only one impact of your comments given where we are in the process, and that would be a very negative impact on our office." He also wrote to Carlin: "Please do not have any direct communication with anyone outside of (our group) on endangerment. There should be no meetings, e-mails, written statements, phone calls, etc." One reason why the process might have been highly charged politically is the unusual speed of the regulatory process. Lisa Jackson, the new EPA administrator, had said that she wanted her agency to reach a decision about regulating carbon dioxide under the Clean Air Act by April 2 -- the second anniversary of a related U.S. Supreme Court decision. In the last few days, Republicans have begun to raise questions about the report and e-mail messages, but it was insufficient to derail the so-called cap and trade bill from being approved by the U.S. House of Representatives. "I'm sure it was very inconvenient for the EPA to consider a study that contradicted the findings it wanted to reach," Rep. James Sensenbrenner, the senior Republican on the House Select Committee on Energy Independence and Global Warming, said in a statement. 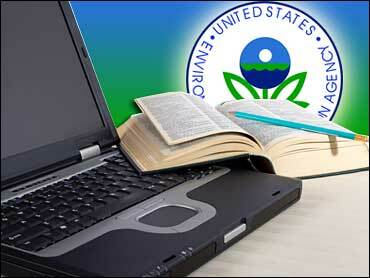 "But the EPA is supposed to reach its findings based on evidence, not on political goals. The repression of this important study casts doubts on EPA's finding, and frankly, on other analysis EPA has conducted on climate issues." The revelations could prove embarrassing to Jackson, the EPA administrator, who said in January: "I will ensure EPA's efforts to address the environmental crises of today are rooted in three fundamental values: science-based policies and programs, adherence to the rule of law, and overwhelming transparency." Similarly, Mr. Obama claimed that "the days of science taking a back seat to ideology are over... To undermine scientific integrity is to undermine our democracy. It is contrary to our way of life." "All this talk from the president and (EPA administrator) Lisa Jackson about integrity, transparency, and increased EPA protection for whistleblowers -- you've got a bouquet of ironies here," said Kazman, the CEI attorney. Declan McCullagh is the chief political correspondent for CNET. You can e-mail him or follow him on Twitter as declanm. Declan previously was a reporter for Time and the Washington bureau chief for Wired and wrote the Taking Liberties section and Other People's Money column for CBS News' Web site.